There are many different types and styles of wedding photography and finding the right style for you is important. Some photographers will arrange every aspect of every scene in an attempt to get the perfect picture every time, almost as if they are using you as paid models to enhance their portfolio. We don't operate in this way, we believe your wedding day is is just that, your day. Getting brides and grooms to get into poses they don't feel comfortable in, or spending hours setting up a shot while keeping everyone hanging around isn't really fair. Whats more, when you look back at your pictures in years to come, all you will remember is how your wedding photographer hijacked your day. We don't set up posed wedding photographs, the only staged shot we do are if our couples ask us for something specific. 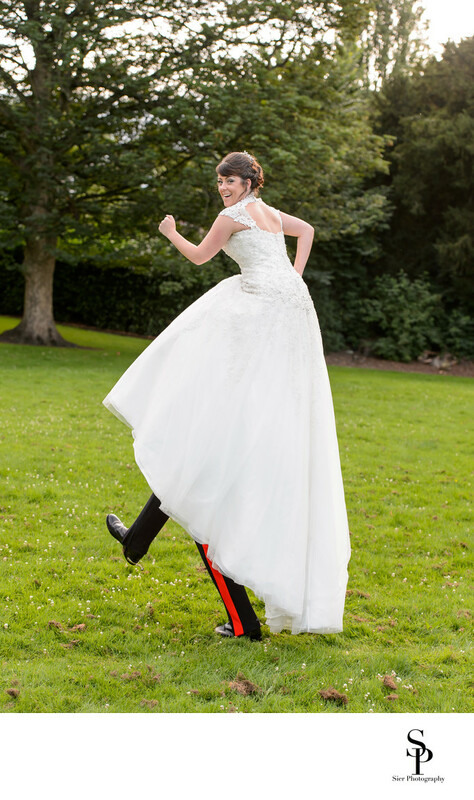 This image of a very long legged bride was the idea of the groom and it really was fun to do. We would never ask a couple to do something they weren't comfortable with but when the couple themselves want something a little different and as this was, fun, we are only too pleased to oblige! Our bride looks like she has some very long legs indeed and is wearing some rather unusual trousers and boots beneath her wedding gown. 1/160; f/4.0; ISO 280; 70.0 mm.